The Orthodox Church throughout the ages has maintained a continuity of faith and love with the apostolic community which was founded by Christ and sustained by the Holy Spirit. Orthodoxy believes that she has preserved and taught the historic Christian Faith, free from error and distortion, from the time of the Apostles. She also believes that there is nothing in the body of her teachings which is contrary to truth or which inhibits real union with God. The air of antiquity and timelessness which often characterizes Eastern Christianity is an expression of her desire to remain loyal to the authentic Christian Faith. Orthodoxy believes that the Christian Faith and the Church are inseparable. It is impossible to know Christ, to share in the life of the Holy Trinity, or to be considered a Christian apart from the Church. It is in the Church that the Christian Faith is proclaimed and maintained. It is through the Church that an individual is nurtured in the Faith. God is the source of faith in the Orthodox Church. Orthodoxy believes that God has revealed Himself to us, most especially in the revelation of Jesus Christ, whom we know as the Son of God. This Revelation of God, His love, and His purpose, is constantly made manifest and contemporary in the life of the Church by the power of the Holy Spirit. The Orthodox Faith does not begin with mankind's religious speculations, nor with the so-called "proofs" for the existence of God, nor with a human quest for the Divine. The origin of the Orthodox Christian Faith is the Self-disclosure of God. Each day, the Church's Morning Prayer affirms and reminds us of this by declaring, "God is the Lord and He has revealed Himself to us." While the inner Being of God always remains unknown and unapproachable, God has manifested Himself to us; and the Church has experienced Him as Father, Son, and Holy Spirit. The Doctrine of the Holy Trinity, which is central to the Orthodox Faith, is not a result of pious speculation, but of the overwhelming experience of God. The doctrine affirms that there is only One God, in whom there are three distinct Persons. In other words, when we encounter the Father, the Son, or the Holy Spirit, we are truly experiencing contact with God. 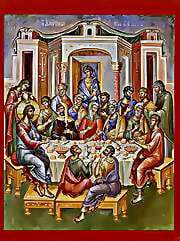 While the Holy Trinity is a mystery which can never be fully comprehended, Orthodoxy believes that we can truly participate in the Trinity through the life of the Church, especially through our celebration of the Eucharist and the Sacraments, as well as the non-sacramental services. Together with the belief in the Holy Trinity, the doctrine of the Incarnation occupies a central position in the teaching of the Orthodox Church. According to Orthodox Faith, Jesus is much more than a pious man or a profound teacher of morality. He is the "Son of God who became the Son of Man." The doctrine of the Incarnation is an expression of the Church's experience of Christ. In Him, divinity is united with humanity without the destruction of either reality. Jesus Christ is truly God who shares in the same reality as the Father and the Spirit. Moreover, He is truly man who shares with us all that is human. The Church believes that, as the unique God-man, Jesus Christ has restored humanity to fellowship with God. By manifesting the Holy Trinity, by teaching the meaning of authentic human life, and by conquering the powers of sin and death through His Resurrection, Christ is the supreme expression of the love of God the Father, for His people, made present in every age and in every place by the Holy Spirit through the life of the Church. The great Fathers of the Church summarized the ministry of Christ in the bold affirmation, "God became what we are so that we may become what He is." The Holy Scriptures are highly regarded by the Orthodox Church. Their importance is expressed in the fact that a portion of the Bible is read at every service of Worship. The Orthodox Church, which sees itself as the guardian and interpreter of the Scriptures, believes that the books of the Bible are a valuable witness to God's revelation. The Old Testament is a collection of forty-nine books of various literary styles which expresses God's revelation to the ancient Israelites. The Orthodox Church regards the Old Testament as a preparation for the coming of Christ and believes that it should be read in light of His revelation. The New Testament is centered upon the person and work of Jesus Christ and the out-pouring of the Holy Spirit in the early Church. The four Gospels are an account of Christ's life and teaching, centering upon His Death and Resurrection. The twenty-one epistles and the Acts of the Apostles are devoted to the Christian life and the development of the early Church. The Book of Revelation is a very symbolic text which looks to the return of Christ. The New Testament, especially the Gospels, is very important to Orthodoxy because here is found a written witness to the perfect revelation of God in the Incarnation of the Son of God, in the person of Jesus Christ. While the Bible is treasured as a valuable written record of God's revelation, it does not contain wholly that revelation. The Bible is viewed as only one expression of God's revelation in the on-going life of His people. Scripture is part of the treasure of Faith which is known as Tradition. Tradition means that which is "handed on" from one generation to another. In addition to the witness of Faith in the Scripture, the Orthodox Christian Faith is celebrated in the Eucharist; taught by the Fathers; glorified by the Saints; expressed in prayers, hymns, and icons; defended by the seven Ecumenical Councils; embodied in the Nicene Creed; manifested in social concern; and, by the power of the Holy Spirit, it is lived in every local Orthodox parish. The life of the Holy Trinity is manifested in every aspect of the Church's life. Finally, the Church, as a whole, is the guardian of the authentic Christian Faith which bears witness to that Revelation. As Orthodoxy has avoided any tendency to restrict the vision of God's revelation to only one avenue of its life, the Church has also avoided the systematic or extensive definition of its Faith. Orthodoxy affirms that the Christian Faith expresses and points to the gracious and mysterious relationship between God and humanity. God became man in the person of Jesus Christ not to institute a new philosophy or code of conduct, but primarily to bestow upon us "new life" in the Holy Trinity. This reality, which is manifest in the Church, cannot be wholly captured in language, formulas, or definitions. The content of the Faith is not opposed to reason, but is often beyond the bounds of reason, as are many of the important realities of life. Orthodoxy recognizes the supreme majesty of God, as well as the limitations of the human mind. The Church is content to accept the element of mystery in its approach to God. Only when the fundamental truths of the Faith are seriously threatened by false teachings does the Church act to define dogmatically an article of faith. For this reason, the decisions of the seven Ecumenical Councils of the ancient undivided Church are highly respected. The Councils were synods to which bishops from throughout the Christian world gathered to determine the true faith. The Ecumenical Councils did not create new doctrines but proclaimed, in a particular place and a particular time, what the Church has always believed and taught. The Nicene Creed, which was formulated at the Councils of Nicaea in 325 and of Constantinople in 381, has been recognized since then as the authoritative expression of the fundamental beliefs of the Orthodox Church. The Creed is often referred to as the "Symbol of Faith." This description indicates that the Creed is not an analytical statement, but that it points to a reality greater than itself and to which it bears witness. For generations, the Creed has been the criterion of authentic Faith and the basis of Christian education. The Creed is recited at the time of Baptism and during every Divine Liturgy. "I believe in One God, Father Almighty, Maker of heaven and earth and of all things visible and invisible. And in One Lord, Jesus Christ, the only-begotten Son of God, begotten of the Father before all ages. Light of Light, true God of true God, begotten, not created, of one essence with the Father, through whom all things were made. For us and for our salvation He came down from heaven and was incarnate by the Holy Spirit and the Virgin Mary and became Man. He was crucified for us under Pontius Pilate, and He suffered and was buried. On the third day He rose according to the Scriptures. He ascended into heaven and is seated at the right hand of the Father. He will come again with glory to judge the living and the dead. His kingdom will have no end. And in the Holy Spirit, the Lord, Giver of Life, who proceeds from the Father, who together with the Father and the Son is worshipped and glorified, who spoke through the prophets. In one, holy, catholic, and apostolic Church. I acknowledge one baptism for the forgiveness of sins. I expect the resurrection of the dead; and the life of the age to come.